From 1972 onwards, the DALEKS were popping up again every year on TV. Usually the first you knew of what was to come was by buying BBC TV guide RADIO TIMES. The small drawings of Doctor, companion, or monster, appeared alongside the description of that weeks forthcoming adventure. They were an eagerly anticipated glimpse of what was to come that Saturday evening. "Look", she said, and held up that now classic RADIO TIMES cover of JON PERTWEE and DALEKS, for me to see, in all its new spectacular glory! 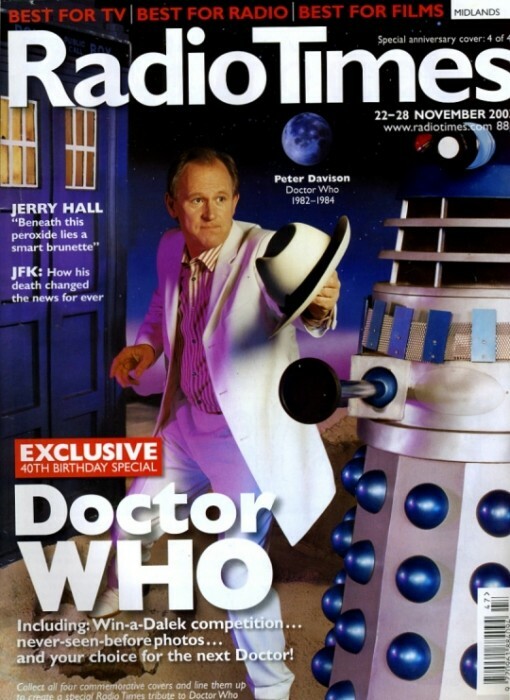 Little could I know that one day in the future, one of my very own DALEKS would grace the cover of RADIO TIMES, to celebrate 40 years of DOCTOR WHO! My mum would have loved to have seen that happen, but sadly it came 3 years too late. As the mid-seventies approached, and with so little material around, I'd taken to 'novelising' DEATH TO THE DALEKS, mainly as an excuse to draw moments from it. This was no doubt inspired by the recent start of the TARGET BOOKS, which now regularly appeared, reliving past TV adventures. 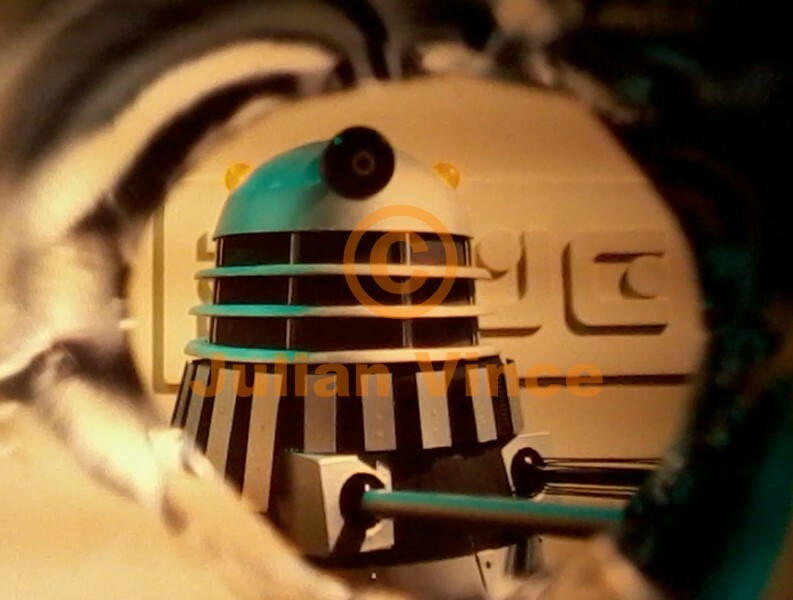 DEATH TO THE DALEKS, is one of my all time favourites, despite the fact that most people hate it, or overlook it. It simply is what it is- pure adventure. In DOCTOR WHO there are 3 basic story structures: Historical, Psychological, and Adventure. So this one is a kind of 'cut-price' INDIANA JONES. It's packed full of running about, punch-ups, explosions, pointless destruction of DALEKS, creepy corridors, a city to explore, and lots of alien beings. It has a Victorian London swirly fog feel to it, complete with candlelight passageways, and gothic 'Phantoms-hiding-in-the-shadows' music. 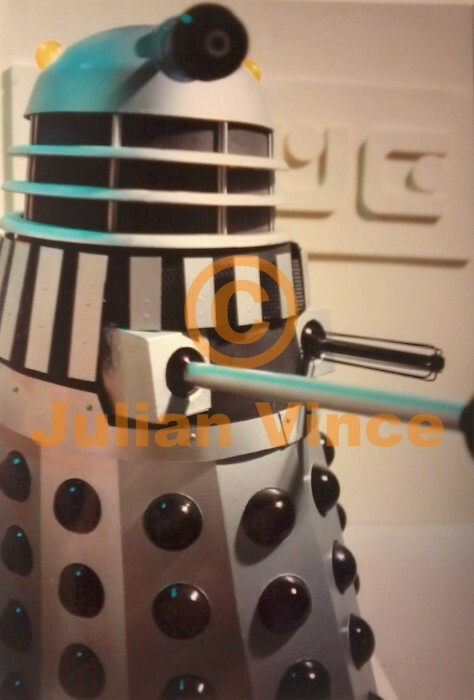 But best of all though, it has silver DALEKS, the true-ist, pure-ist DALEK colour scheme. It's what they were always designed to be. This story is like an alien holiday in a sandpit. It skips along nicely, is fun and enjoyable, and exciting. It's the DALEKS getting tied naked to lamp posts just before they 'get married' and stop being fun, by becoming (right) elbowed to one side by their on-screen creator. It's my most watched, for fun, and everyone else's least, but it inspired me to build my first ever full size DALEK!